Apart from the migration spectacle in Batumi, the Caucasus has a lot more to offer in terms of birding, nature and local culture. Batumi Birding offers tours throughout the region, encompassing Georgia, Armenia, Azerbaijan and East Turkey. The tours benefit for the expertise from the BirdLife partners in these countries, and help them to fund their conservation programs. 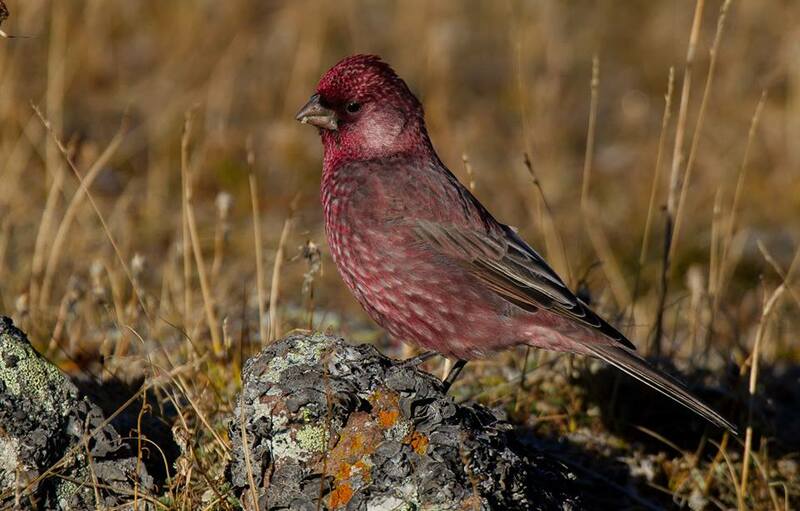 Great Rosefinch. Photo by Silas Morreeuw. Georgia boasts an amazing diversity of habitats and species. While the western parts are very humid and covered in lush forests, landscapes in the east of the country consist mostly of steppe and savannah. Near the coast you find the impressive Kolkheti marshes, a key stopover site on the Eastern Flyway. And of course Georgia is a country of mountains: the Greater Caucasus in the north features sharp peaks, deep valleys and large glaciers. It is home to many of the region’s endemics, such as the Caucasian Snowcock and the East Caucasian Tur. By contrast, the lesser Caucasus consists mostly of high plateaus dotted with alpine lakes and volcanic cones. The Velvet Scoter has a relict population here, and some of the lakes host colonies of both pelican species. These high plateaus continue south into Armenia, and surround the mighty lake Sevan, home to a big share of the world’s population of Armenian gull. These plateaus gently slope down towards the Aras river in the south, which is bordered by dry rocky areas where many Indo-Iranian species reach their westernmost distribution. In the Aras valley lie the Armash marshes, rich in wetland species and a heaven during migration. A particular highlight is Armenia’s highest mountain, Aragats, which offers a succession of interesting species along its southern access road, leading from 1000 to 3000m. Caucasian Horned Lark. Photo by Johannes Jansen. East Turkey lies within easy reach from Batumi, and features great birding in amazing landscapes. Wildlife in Turkey is under serious threat, but its far east has preserved some gems. Here you find the last breeding demoiselle cranes and great bustards of the region, reedy lakes with white-headed ducks and mountain ranges inhabited by Caspian snowcocks. On the slopes of Mount Ararat, near the majestic Ishak Pasha palace you find such Eastern goodies as Mongolian finch and Grey-necked bunting.